This Light Award is sponsored by My Secrets of Success and processed through Kiva.org. Tep Choeun is a 54-year-old farmer who lives in Pursat Province in Cambodia. 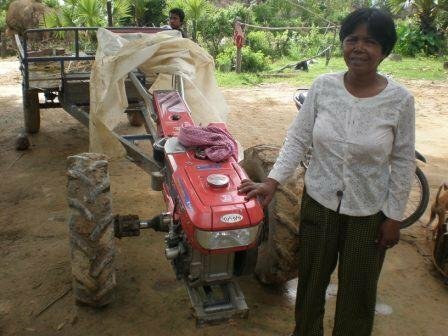 Tep is married to Mr. Cheang, age 55, who works with her in their farming business. They own and use a cultivating machine for farming and plow a nearby farmer’s land for a fee. There are many farmers who need their plowing services but they can't fulfill their needs because they only have one machine. To satisfy more customers, Tep would like a loan to purchase one more machine.